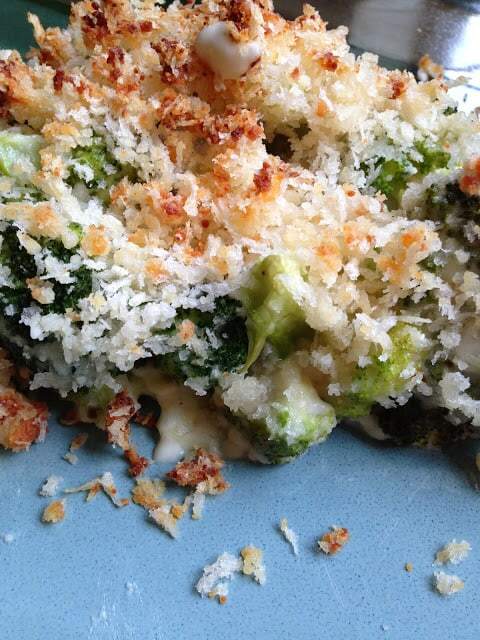 Cheesy Broccoli Gratin is super delicious. Gratin s are a great way to showcase any vegetable but certain vegetables such as squash, potatoes, and broccoli work especially well in gratin. Most if not all gratins are topped with some sort of buttery, cracker topping. This recipe calls for a topping made of panko bread crumbs and Parmesan cheese, making this topping lighter than most traditional toppings with a nice crunch. What are panko bread crumbs? I’m glad you asked! Panko [PAHN-koh] hailing from  Japan, panko is a type of crisp, light, large breadcrumb. The crumbs are used to coat foods for frying or sautéing as well as in recipes as a topping. Because panko crumbs are coarser than most breadcrumbs, panko creates a deliciously crunchy crust. Panko can be found in Asian markets and in the ethnic section of most grocery stores. A gratin is any dish that is topped with cheese or breadcrumbs mixed with bits of butter, then heated in the oven or under the broiler until brown and crispy. The terms au gratin or gratinée refer to any dish prepared in this manner. Special round or oval gratin pans and dishes are ovenproof and shallow, which makes for a larger surface area, therefore insuring a larger crispy portion for each person. Melt butter in a small saucepan over medium heat. Whisk in the flour until smooth. Add milk, cream, salt, pepper and cayenne pepper and continue whisking until mixture comes to a low boil. Reduce to a simmer and stir in cheddar and fontina cheese until smooth. Remove from heat. Meanwhile bring a small saucepan with 1-inch of water to a boil. Steam broccoli just until bright green, about 5 minutes. Remove from heat. Grease a casserole dish. Add broccoli and fold in cheese sauce so all the broccoli is well coated. In a small bowl, mix panko crumbs, parmesan cheese and olive oil. Sprinkle over broccoli mixture. Bake at 400º for 15 to 20 minutes. Cheese sauce should be bubbly and bread crumb mixture well toasted. Remove from oven, let sit 5 minutes before serving. Chop Suey American Style is a fantastic recipe for this American classic. 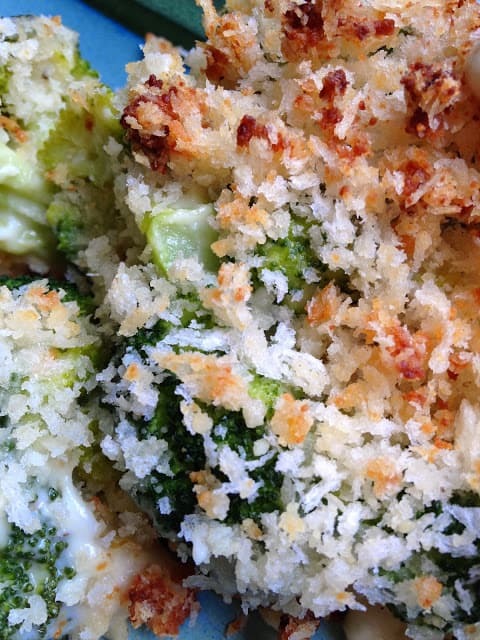 Your Cheesy Broccoli Gratin looks delicious! Thanks so much for sharing your awesome recipe with Full Plate Thursday. Hope you have a great week and come back soon! I love broccoli and this looks really tasty. The panko breadcrumbs look great – better than regular breadcrumbs. This is a great looking dish. My partner adores broccoli in just about any incarnation, so I know he just going to love this dish – excellent choice. Yumm! Creamy, cheesy broccoli. Perfect side dish – great pick!! Oh yum! Cheese is definitely a must with broccoli! This sounds delish! Wow this sounds so delicious, Lynn. Beautiful dish and great choice! 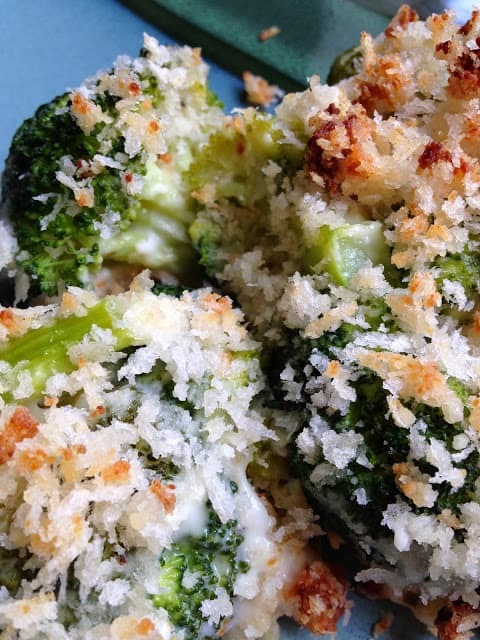 Broccoli is probably my most favorite veggie – and cheese with it – heck yes! This looks like a fantastic side dish 🙂 Great choice – happy reveal day! Cheese + br0ccoli = married! Great SRC pick! It was wonderful Melissa~ A must try!! Hi Sally, We have broccoli at least once a week too:) We love it!